There are a lot of professional dentists in Florida that are experienced and committed to caring for patients with special needs. Special needs dentists receive 2-3 years of extra schooling which ensures they are perfectly equipped to care for patients. At Emergency Dentists USA we work to make finding the perfect dentist easier for you which is why we’ve researched the best special needs resources for you to help you begin your search. Finding the perfect dentist can be easy with guidance, recommendations, and resources. You’ll be able to find a dentist you love and trust and someone who will make going to the dentist a breeze for your loved one with special needs. 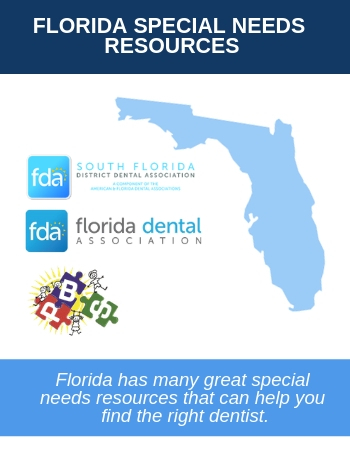 Florida has many great special needs resources that can help you find the right dentist. The Florida Dental Association provides dental care information and has a list of Florida dentists who are a part of the association. They also have a list of resources for dentists who provide charitable care for those in need. South Florida District Dental Association focuses on providing resources specifically to communities in Southern Florida. One great tool they offer is helping you search for a dentist based on location and specialty. Search for a special needs dentist near you, here. Progressive Behavioral Science is based out of Miami but provides information and resources for the entire state of Florida. They provide therapy and care for children with special needs; here is their directory for special needs dentists across Southern Florida. Other places to reach out to in Florida include collegiate dental schools. These colleges are filled with dental students looking for hands-on experience. Dental school programs often offer care for patients with special needs at a fraction of the price. Another great way to help you find a dentist in Florida is by reaching out to national resources. The American Dental Association also allows you to search for a dentist by location and specialty. They are a great resource for all things dentistry, especially special needs dentistry. Visit their website to help prepare for your loved one’s appointment and research what to expect during their dental visits. 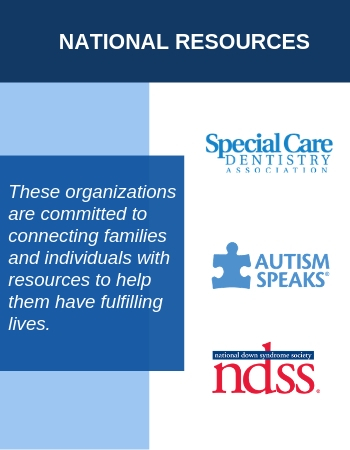 Another great national resource is the Special Care Dentistry Association. Their special care dentist referral service can refer to you a dentist in or near your city. You can even specify which insurance you have to make sure the dentist you find fits your needs. Two national special needs resources that provide a ton of useful information are Autism Speaks and The National Down Syndrome Society. These organizations are committed to connecting families and individuals with resources to help them have fulfilling lives. Are you comfortable working with a patient with special needs? This is an important question to ask as some dentists may not feel comfortable or equipped to accommodate a patient with additional needs. Pediatric dentists receive 2-3 extra years of schooling and are a good start when finding a dentist. They are able to use their schooling to better provide dental care for a patient with special needs. Do you have experience working with patients with additional needs? When finding a dentist you will want someone who has previous experience. Be sure to listen for specific examples of a time when a potential dentist has worked with a patient with special needs. Overall they will be more comfortable in ensuring visit runs smoothly and that their patients are at ease throughout their checkup. What special accommodations can be made? Your child or loved one has unique needs and may need to have special accommodations made during their appointment. When speaking with dentists, be sure to ask if they are willing and able to make any special accommodations that your loved one may need. This can be anything from having a specific toothpaste flavor, reducing waiting room times, or making sure that the dental chair stays in the same position throughout the visit. Once you have chosen a dentist, you will want to take some steps to prepare for the visit. Preparing ahead of time is important because it can help decrease feelings of anxiety. 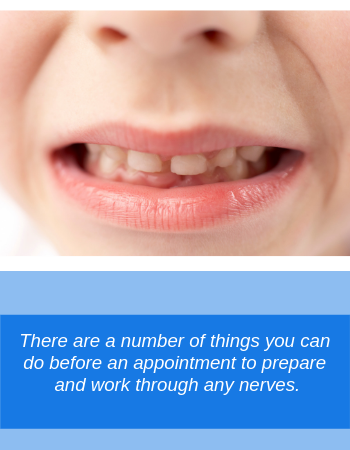 There are a number of things you can do before an appointment to prepare and work through any nerves. Visuals are a great way to see what happens at the dentist and make connections. This can be done with stories or videos and gives the patient a way to see what will be happening at their visit. Visiting the dentist before the scheduled appointment can be beneficial because it allows patients to familiarize themselves with the environment such as seeing the lights and equipment, and hearing the sounds. You and your loved one can meet the office and staff members and go over any accommodations that may need to be made. Sometimes patients with special needs can benefit from being sedated with general anesthesia during a dental appointment. Those who are extremely apprehensive or uncooperative may need sedation during their appointments in order to receive the care they need. Sedation dentistry, or “sleep dentistry”, helps to keep the patient calm and in a relaxed state. This type of sedation is not the same as being put under. Inhaled minimal sedation: Breathing in nitrous oxide combined with oxygen to help relax. Your dentist is in complete control of sedation that is given. Oral sedation: Can range from minimal to moderate. This type of sedation is most commonly associated with sedation dentistry. The pill makes will make the patient drowsy while a more moderate dose may make the patient fall asleep. IV moderate sedation: A sedation drug is given through a vein and works more quickly. Your dentist will be able to continually adjust the sedation levels. Deep sedation & general anesthesia: Medication is given that will make the patient nearly or totally unconscious. While under general anesthesia you cannot easily be awakened until the effects of the medication wear off or are reversed. If the patient suffers from any other medical conditions be sure to consult with your dentist before choosing a sedation method. You don’t want any medication from the sedation to interfere with the medical condition. Finding a special needs dentist can be hard and it can be even more intimidating reaching out to them for the first time. That’s why our team has gone through as many dental offices as we could to find practices that specifically mentioned working with patients with special needs. We’ve provided you with all the information you will need when scheduling an appointment and hope you find this list useful. If you think there is a practice that should be included in our list, we encourage you to reach out to us! Dental Office:	Douglas T. Andrews, D.M.D. Dental Office:	Dr. Gabriel A. Nossa D.M.D.